Tales from the Den of Chaos: Finished Object! Otherwise entitled: One down, four to go! Hmm. Now I’ve gone and depressed myself. Let’s look at a picture – that’ll cheer me up! 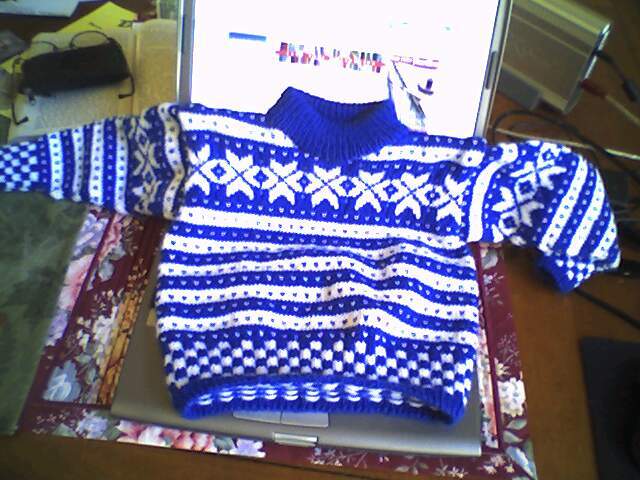 This sweater caused me to use, for the very first time, my Kenmore sewing machine. My husband bought me this machine about ten years ago, while he was laboring under the impression that I was ‘crafty’. As in, did crafts. As in, would need a better sewing machine than the one I had. Let me just get this out in the open right here, right now: I. Do. Not. Sew. I knit. That’s it. I don’t sew. What sewing I do involves seaming things I have knitted; and even that I don’t do in a sewing sort of way. I do it in a grafting sort of way, which is different. I took a sewing class once. Never even got to the point where we flipped on the sewing machines – not really because I was that stupid, but because my babysitter got all flaky on me and I had to stop going to the class because she stopped showing up. Or when she did show up, her boyfriend would show up a few minutes after I left and they’d take the kids with them. Without car seats. In his truck. Anyway. My old sewing machine is a vintage Singer Featherweight. It has two speeds: going, and not-going. It has three stitch lengths to choose from, can go forward, or backward, and that’s about it. You can do buttonholes if you’re cunning. It can punch through three layers of denim (or needlepoint and felt); fortunately, I’m not all that into silk so I don’t care that it would turn it into something that resembled my pantyhose after a four day weekend picking blackberries. If I were crazed enough to wear pantyhose on a blackberry picking expedition, which I’m not. Not quite, anyway. The Kenmore, on the other hand, has about eleventy-twelve different stitch types. Zigzags and hilly looking things, short, long, doubled…and for each stitch type, you have different lengths. It has a bunch of ziggy-whatzits for the thread. It has a light (you know, for if you’re sewing in the dark), and this funky antenna thing that turned out to be where the thread spool was supposed to go. Fancy that! Anyway, I’ve felt guilty about that Kenmore ever since I opened it up on Christmas morning, 1995. So when confronted with the need to run a double set of machine stitches around the steek stitches on this little sweater, I whipped it out and spent the next hour cussing and sweating and fighting until I figured it out put in the stitches. Geesh. 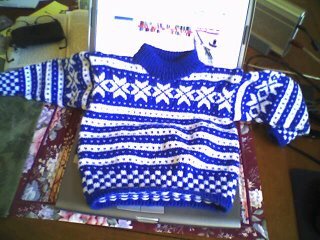 Hours and hours and hours later, I really am asking myself what I was thinking deciding to make a sweater for anybody, even a wee little lad of two years. But then, it’s adorable. Which makes me decide it was all worth doing and I’d really love to do it again. For the record? It was about 74 degrees in the house. If you’re a Hollywood agent, please call me. I have the next Shirley Temple here in the Den. Big beautiful blue eyes, sincere smile, and she says “here” as if she were from Maine: Hear-yah! So now, while I wait for the ridiculously large box of yarn for the other four sweaters to arrive from KnitPicks (CURSE THEM, for enabling me so! ), I’ve moved on. A baby blanket, in mostly straight stockinette with a single slipped-stitch detail every twelve stitches. PS - That sweater is darling and I am in complete awe of your skill. I have yet to try anything with more than a single color. And the one time I had to add in a ball of yarn...well, let's just say it didn't go well. If I lived to be 100 I couldn't kniit a sweater like that. Very nice!